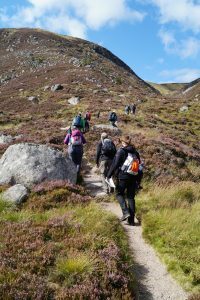 The Adopt a Path scheme is part of The Mountains & The People project and based on a pilot scheme developed by the Outdoor Access Trust for Scotland. The scheme asks volunteers to inspect and report on the condition of their adopted path once or twice a year. Using the information gathered by volunteers, the project partners will engage path contractors and volunteer work parties to help maintain paths so that people can continue to enjoy the hills with the minimum of impact on this fragile environment. We are looking for volunteers to adopt paths in both of our National Parks. Paths can be adopted by individuals or groups (such as hill walking clubs). Some paths are shorts sections, others are from car park to summit; some paths are in remote locations, others more easily accessible. Once registered, volunteers can choose which path they would like to adopt, from the list of available routes. All Adopt a Path volunteers will receive training and support to undertake their surveys in a safe manner which provides the type of information we require to ensure these iconic paths are maintained for generations to come. – have good health and safety awareness. The Mountains and The People is unique 5 year landscape scale project lead by the Outdoor Access Trust for Scotland, supported by the Heritage Lottery Fund and in partnership with Scotland’s two National Park Authorities, Cairngorms and Loch Lomond & the Trossachs, Forestry Commission Scotland and Scottish Natural Heritage. To find out more have a look at our website. Adopt a Path is go!